Will Samsung take a note from Google's Daydream View? 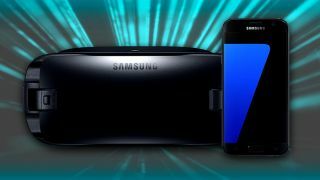 It seems a new Samsung Gear VR is in the works for the upcoming Samsung Galaxy S8, and it may have its own special controller to boot à la Google's Daydream View headset. Samsung could be preparing to announce a new generation of its virtual-reality headset next month that's designed to work with Samsung's yet-to-be-unveiled flagship phone, according to SamMobile. Since then, an FCC filing was also uncovered showing what could be a peripheral designed for the unannounced VR headset, SamMobile adds. Adding to the claim was a tweet from WinFuture.de contributor Roland Quandt, who posted via Twitter that a new Gear VR model "is coming" and will feature a new front cover to hold the S8 and come with a single-handed controller. The current Gear VR headset uses a trackpad on the side for navigation and control, but can also support certain controllers - to include the Xbox One's own gamepad - over Bluetooth. With a dedicated pack-in controller, the next generation of Gear VR could be an easier sell to those wanting more capable controls for playing VR games - not to mention could allow future Samsung phones to be Daydream-ready without relying exclusively on Google's own headset. Though there's no telling just yet when Samsung will release a new Gear VR, the electronics giant is expected to tease more information regarding the S8's official reveal at the end of the month during MWC 2017. Though the latest handset in Samsung's flagship line is rumored not to hit stores until April, we hope more information on Samsung's VR efforts will also be revealed in the months leading up to the new handset's release.